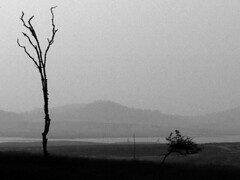 Black and white landscape shot taken in the Pench Tiger Reserve, Madhya Pradesh (Central India). The photograph was taken at dawn from the edge of the forest towards the Pench river. Was it taken on greyscale?